Theresa May’s extraordinary manifesto launch, in which she appeared as equal parts Shiva, Inspector Gadget, and badly regurgitated Thatcher, has been poured over by faithful stenographers and scribes for signs of ‘vision’. They may be disappointed. The story of the Conservative’s un-costed manifesto has three distinct elements: the first is it’s almost lupine aggression against the most vulnerable in society; the second its poorly disguised and botched attempt at ‘populism’; and the third its incredible redefinition and attack of democratic principles and constitutional settlement. The government will continue to exert pressure on non-EU migration by increasing earnings thresholds for family migration, introducing tougher visa rules for people coming to study, by doubling the immigration skills charge to £2,000 a year for each skilled worker recruited, and by increasing the NHS charges they pay. Who cares? It’s all detail in the white noise as the banshee shrieks: ‘Strong and stable” and the media smear Corbyn and anyone guilty of political thought crime beyond the prescribed and accepted norms. But beyond the putrid social policy outpourings of the Conservative party are an explicit attempt to block the democratic will of the elected Scottish Parliament. Operating in naked class interest is nothing new, but this is. Under a section headed “Our precious Union,” the UK party’s programme for power (with the sacred words ‘Conservative and Union’ embossed on every page) says: “The United Kingdom has voted to leave the European Union but some would disrupt our attempts to get the best deal for Scotland and the United Kingdom with calls for a divisive referendum that the people of Scotland do not want. We have been very clear that now is not the time for another referendum on independence. In order for a referendum to be fair, legal and decisive, it cannot take place until the Brexit process has played out and it should not take place unless there is public consent for it to happen.” This effectively rules out a referendum until 2022 and overrides the Scottish Parliament. It is democracy trumped by vagueness. The Tories are going for gold. What on earth is “public consent”. Is it 55 out of 59 MPs? Apparently not a mandate. Is it a democratic vote in the (proportionately) elected Holyrood parliament? Apparently not. This is a proto-colonial approach to rule. While we get caught-up in the perceived (and real) accusations of media bias, it’s important not to lose sight of the more insidious ways in which the media are allowed to frame and re-calibrate the constitutional discussion in the heat of an election campaign. Democracy only ever means what the people in power say it means. May interprets it differently to Corbyn and to Sturgeon and to PickAPolitician. Democracy is certainly not an all encompassing construct of society – it only ever plays a percentage-part in governmental decision making – once a person/party has been elected, in their mind they have been given the power to rule without interference. That’s just how they see it, the current crop anyway. That’s how “strong and stable” leaderships the world over are interpreting their democratic mandate. The people have put them in power to rule. It doesn’t matter if it’s Trump or Theresa or Hitler, once they’ve been given their mandate by the people they can do what they want. Anyone who disagrees is anti-democratic. Democracy was great while it lasted, but we’re all just humans at the end of the day, and some humans just want control really badly. Like, REALLY badly, whatever the cost. This isn’t the end of the world, but it IS the start of a big change in how we live our lives, and especially the access we have to each other. The people have put them in power to rule. It doesn’t matter if it’s Trump or Theresa or Hitler, once they’ve been given their mandate by the people they can do what they want. That happen when you have not a written Constitution it appear that in great Britain does not exist citizen only Servants of the monarch or perhaps serfs. This isn’t the end of the world, but it IS the start of a big change in how we live our lives, and especially the access we have to each other. Yes isn’t it, but the only solution is an Independent Scotland, there is nothing to talk or resigned to be slaves for ever. the good that government can do,” she says in the manifesto. What does it mean the manifesto for her? A New Constitution ! If so ,Well let me paraphrase a great of America, because I do not know what resources the villager has on account or her head. that go by the air asleep gobbling up worlds. What remains of a village in Scotland must awaken. We are going back in time with Theresa and the Tories to a place where the rule of law is decided by an elite for the benefit of the elite. Democracy and all it’s attendant supporting principles was just an aberration in feudal England after the sacrifices made in two major wars by ordinary people. That is all in the past and now England’s rulers can return to business as usual,where in the not too distant future,only those who support the establishment will have a say. The SNP has mopped up every left wing vote with their anti-Tory rhetoric but still fell well short of winning the “once in a generation” referendum in 2014. It is surely time to wake up and smell the coffee. Continually demonising the Tories is not going to convince a single NO voter to change their mind. The best way to attract and retain No voters is to get the media onside, stoke fears, appeal to avarice, demonise others, jettison the vulnerable from electoral calculations. But the Tories are already doing that, so we will have to think of something else. Harry Molloy it is all there in print in a “Book of Ideas” produced by the “Common Weal” a way forward for Scotland it is all forward thinking chock full of initiatives/thoughts and ideas,cutting away the political baggage that weighs down everyone of them the SNP included,Robin McAlpine says in it that you will never change peoples minds by scare stories by hoping they will bring their own house down,you have to go out there and show as best you can there is a better world awaiting us. Maybe, just maybe, human nature is such that not only does it not care for the old, ill or infirm, but would actively harm or even kill them. YouthanAsia as Hitler showed is the way to go with those who are deemed a burden on the more exalted in society. 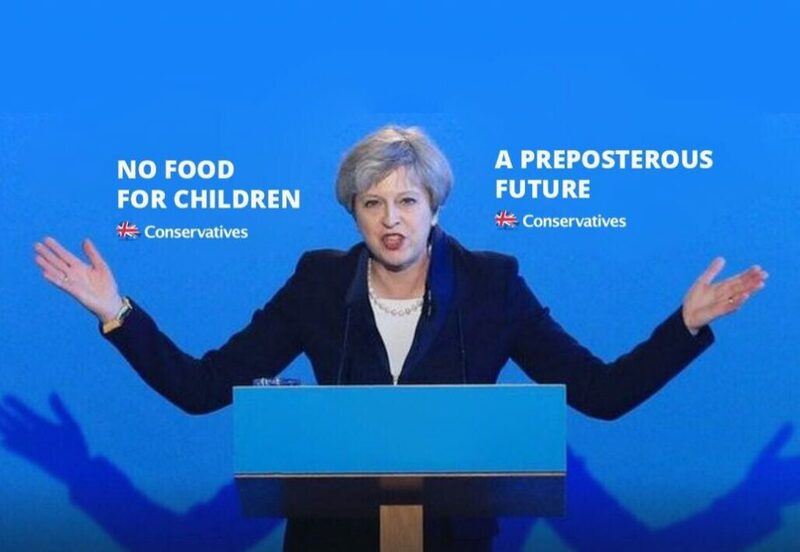 The Tory mantra- don’t get old, don’t get ill, don’t be poor, and if you do, you’re on your own is the reality. And who voted for this right wing ideology when they voted No in their droves. Lets keep it simple. A simple majority of Scotland’s MP’s is enough to dissolve the union of parliaments in the same way it was enacted, and to declare independence on June 9th. There is no need to prolong the agony and ignominy of Scotland’s colonial status within England’s ‘union’ fraud. And there is no need for Scotland to depend on any dubious referendum requiring permission and ratification by 600 MP’s of other nations. And that Alfred is why the Conservatives are seeking to inculcate a Loyalist Unionist vote. It’s their attempt at the Ulsterisation of Scottish politics. That is the way Britain has always done it, and will do it again as it senses democratic defeat.